The Brazilian Keratin Treatment - Sponge Free Effect Crome range, which is formulated using the best active ingredients for capillary filling and sealing, reduces volume by eliminating the sponge effect whilst also increasing the mechanical resistance to hair breakage to leave it stronger and healthier. It has an innovative formula that enables it to improve the texture of hair strands incredibly, because it contains a cationic complex that is able to precisely identify the damaged parts of the hair, restoring them and giving them back all the malleability of their structure. It contains Prodew 500® and Hyaluronic Acid which reintegrate and rebuild the hair fibers and it has been enriched with oligoelements that provide nourishment, seal the cuticles, and coat the strands to prolong the straightening effect. 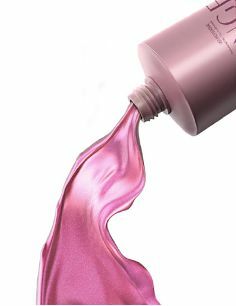 Your hair will be much stronger, shinier and silkier, and will have a completely natural straight and illuminated look. Result: Super resistant hair, with no volume, restructured from the roots to the ends, with a radiant shine. Hair fiber rebuilder and scalp treating agent. This is an innovative active ingredient with rebuilding power. It fills intercellular gaps perfectly, revitalizing all your hair. It also acts on the scalp to improve the hair from the roots. It is naturally found in connective tissue, and has been used in esthetics for years, to improve skin sustainability and elasticity and to eliminate expression lines. Its hydrophilic properties act on the hair to maintain the fibers’ natural moisture, and recover their balance, elasticity and cohesion. It also acts on the scalp to reestablish its hydration levels, thus enabling the hair to grow in a healthier, stronger and shinier way. State-of-the-art technology with a combination of 11 powerful amino acids. Its composition restores the surface of the strands, to immediately return their luminosity. It helps align the cuticles and intensely reduces hair volume. The oligoelement complex regenerates the structure of the capillary fibers, filling all the damaged strands and recovering hair strength. These oligoelements are responsible for protecting against hair loss, regenerating the cuticles and maintaining the level of hydration necessary for healthy hair. The natural loss of moisture from capillary fibers causes loss of shine, breakage and scaling. The oligoelements used, such as calcium, zinc and silicon play a fundamental role in ensuring that hair continues to look good and be nourished, giving it back its malleability and shine, as well as greatly reducing the volume and strengthening the hair from end to end. 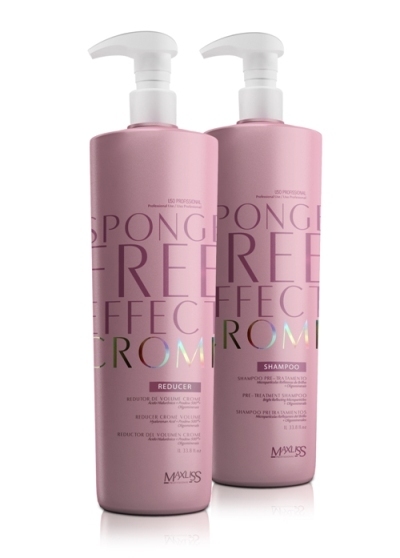 1- After washing hair with Pre-Treatment Crome Shampoo, dry 80% and apply Volume Reducer Crome in thin sections. 2- Remove the excess and align the hair with a fine comb. After this process, wait about 40 minutes and rinse with water only to remove the product. 3- With the dryer dry the hair completely, comb it and use a flat iron 10 to 15 times with temperature up to 220ºC.